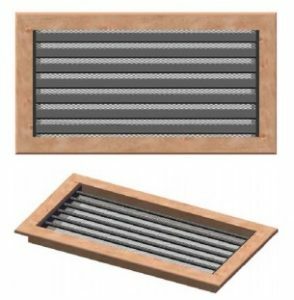 Mermaid is able to provide a vast array of Teak, Mahogany, Ash, Oak, Maple, and Cherry return vents to be used for those application where appearance is important! We stock most sizes of Teak vents, there is an additional lead time of approximately 2-3 weeks for the other species. Each grill is measured by it’s “cut-out” dimension. Ensure that you leave 1/2 inch around the vent for the “lip” of the grills. Each grill size in calculated in inches.